Piling Protectors are a great containment option for any location looking to perform maintenance or repair on docks and pilings. Constructed to fit neatly around pilings, these protectors feature an impermeable fabric material that can effectively catch paint, moss, growth,	and	other	contaminants in the areas. This keeps pollutants contained to the source and prevents unwanted materials from spreading around your water location. Piling containment protectors are available in either a mat or extraction model. Standard mats float around pilings to catch falling debris and prevent further contamination, while piling extraction systems work to contain materials as the piling is removed from the water. The piling protector is a containment barrier designed to fit closely around pilings. Protectors will feature a central open area that accommodates the diameter of your piling. The remainder of the mat is a flat surface area that connects around the piling. This creates a custom mat that will catch anything falling immediately around the piling. These pylon systems can vary depending on your area conditions and containment requirements. Typically, once the diameter of the pylon has been established, the system can be built to the length required to effectively surround and contain the pilings. Maintaining space to the pylon and the float can be achieved by using anchor points or stand off posts. There is usually a split in the floats/skirts that help allow these units to fit around an anchor post. Once the device has been placed around the post, it should be laced together to form a tight barrier system. View Pylon Work pdf for more information. Similar to the item shown above, these piling extraction systems fit directly around a pile and unroll as the pile comes out of the water. This helps to contain materials around pilings and protect the surrounding areas during an extraction process. Learn more about Turbidity Control System. For more information on this piling extraction system, please check out our Piling Protection for Pile Extraction. Floating Containment Mat: The floating containment mat can be placed under bridges and along dam walls to contain falling debris, tools, and lead paint before it enters the water. These mats are designed to lie flat and catch debris as it falls. Pylon Extraction: These containment socks attach to pilings and unroll as the pile is extracted. Floating Turbidity Curtain: Our most commonly used silt and turbidity containment method is our standard floating containment boom. 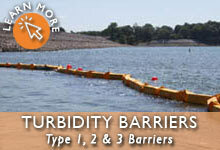 These barriers are used around construction, repair, dredging and maintenance sites to keep silt and turbidity contained.